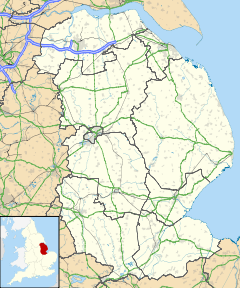 Barton-upon-Humber or Barton is a town and civil parish in North Lincolnshire, England. The population at the 2011 census was 11,066. It is situated on the south bank of the Humber Estuary at the southern end of the Humber Bridge. It is 46 miles (74 km) east of Leeds, 6 miles (10 km) south-west of Hull and 31 miles (50 km) north north-east of the county town of Lincoln. Other nearby towns include Scunthorpe to the south-west and Grimsby to the south-east. ^ a b UK Census (2011). "Local Area Report â Barton-upon-Humber Parish (1170211327)". Nomis. Office for National Statistics. Retrieved 2 March 2018.